I’ve been hesitant to start blogging about the art projects I do with my boy because I worried whether it would be consistent with my work. However, it was one of those ideas I couldn’t ignore it any longer. When I decided to put this post together, I happened to come across an Instagram post of Andy J. Miller’s and it happened to confirm that I was on the right track. (It also goes along well with the Easter egg theme of this Mommy + Me Art!). If you sit on it 'til you’re 100% sure, it’ll never hatch!! It’s time. . .let you're idea leave the nest. Now, an introduction as to why I want to do this. I am super passionate about art and sharing my creative process, as you can see. My work and love for art spills over into how I parent. For example, I was very excited to start reading to him because I couldn’t wait to introduce to beautiful illustrations that my favorite illustrators and children’s book writers created. The first book I read to Anthem was “Stuck” by Oliver Jeffers when he was three months old. I didn’t think anything would come of it, but alas, my boy loves to read and is very observant. He sees things in new ways that add to my creative work. When he was three he was memorizing logos like Starbucks and Target! Probably because his mama took him to those places a lot, but hey, he was paying attention to his surroundings! He once observed that the Burger King logo was a burger. That’s a place I’ve never taken him to, so I was way impressed, but I was mostly impressed because I’m pretty sure I was eleven when I realized that the BK logo was a burger! I could tell pretty early on that Anthem had an eye for design. Learning the shapes and colors came so naturally to him. I took this as an opportunity to teach him what I learned in my design and color class which was to make designs using shapes. I was teaching him to break down objects into the basic shapes. These activities was also a plus for me in that I was able to create more often. I may not have been illustrating, but I was still creating and refreshing myself on design basics! Keeping those creative juices flowing is detrimental for my soul! Plus, the things my boy wanted me to draw had me learning things I wasn’t interested in learning. I could care less about drawing school buses and fire trucks, but now I’m a pro at drawing those things and I challenged myself to draw them with one continuous line! It was a win-win situation! So in short, I believe art is good for kids. Maybe I’ll get into the science of it later, but for now here’s the latest project Anthem and I worked on. Try layering ink on top of crayons. It creates a cool effect. 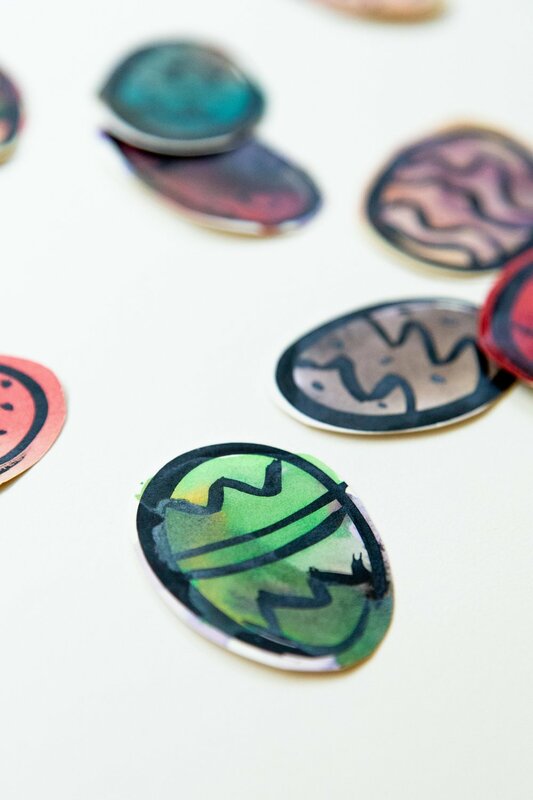 If you’re not in for experimenting and doing this project all on your own, you can download the Easter eggs printable below. I recommend printing on matte card stock paper if you’ll being using paints. It’s sturdy and has a texture that will hold watercolor paint. I’d love to see what you do with them (cake or cupcake toppers?!?!) so please share your creativity with me on Instagram by tagging me @victoria_riza! Anthem and I made a garland out of the eggs. He also made up a game where he’d scatter the eggs on the floor and then we’d have to race to see who could pick up the most eggs. This may be an eco-friendly alternative to hunting plastic Easter eggs! I hope you enjoy and Happy Easter! EASTER EGG PRINTABLE download here. Easter egg printable is intended to print on 8.5 x 11 inch paper. Please check your printer settings to make sure it prints at the intended size. All printables are copyright by Victoria-Riza and are for personal use only, not for resale or distribution. I am an affiliate of the Blick Art Materials Program and may receive commission from sales from the links above.